I was pleased to bag a shot of a tiny Holly Blue butterfly in my garden this morning, having chased a Brimstone around without success. The butterflies and bees love verbena bonariensis – such a reliable self-seeder here and conveniently at head height for photographers with dodgy backs! A non-buggy post tomorrow, I promise! This entry was posted in garden, nature, photography and tagged butterfly, garden, holly blue, macro, photograph, photography, verbena bonariensis by Rachael. Bookmark the permalink. You are welcomed to check my gallery. Oh, but I loved this buggy post. That’s the most beautiful butterfly I’ve ever seen. Like it much better than the flashy ones like Monarchs. Beautiful shot! 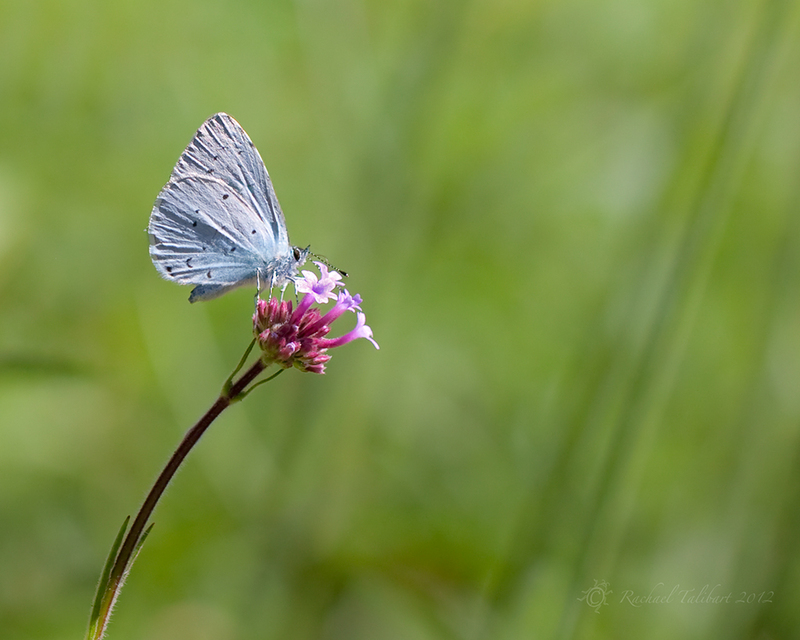 I love the little blue butterflies too! They seem much friendlier and ready to accept the extra attention. Just read an article on how a photographer found a new species if insect in the Malaysian forest. You might know the photographer on Flickr by the name of Kurt, and it reminded me of how many insect photos you take, and maybe one day you will be the next discoverer! Hi Kevin. Thanks. I did see that on Flickr. It’s a super shot too. Maybe I will, although probably not in my back garden! Classically beautiful and great Bokeh. “Blue and green should never be seen,” I recall my mother saying in reference to some perhaps-unfortunate fashion statement of mine way back.